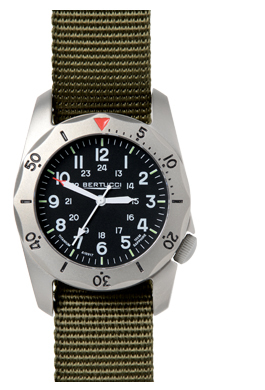 The A-2TR Vintage™ is inspired by classic U.S. military watches. 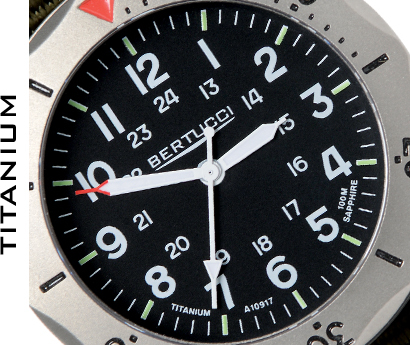 The period authentic dial is complimented by our rugged U.S. Patented 40 mm solid titanium Unibody™ case. 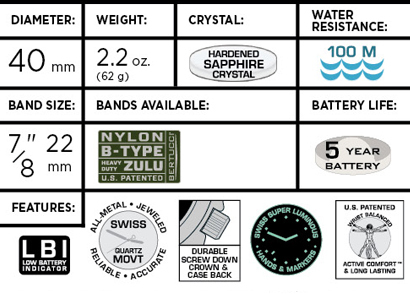 This watch has all the requisite features when it comes to delivering focused essential function... a precision Swiss made quartz movement with LBI Low Battery Indicator, durable screw down crown & case back, scratch resistant sapphire crystal, and a unidirectional titanium elapsed time / directional ring. Equipped with a solid titanium unidirectional rotating ring. For elapsed time: For simple quick method to measure up to 60 minutes... rotate the red triangle (the 0 minute marker) counter clockwise to align with the minute hand. As the minute hand moves as time passes, the time elapsed is shown on the outer ring minute markings where the minute hand has moved to. 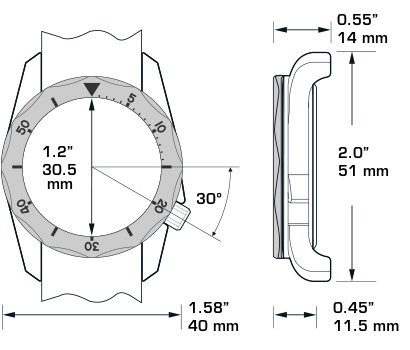 The rotating ring can also be used as a compass directional ring (see owners manual).